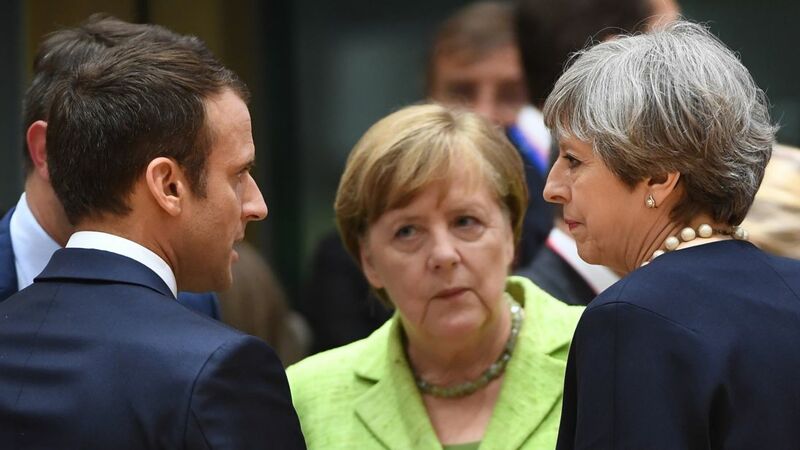 Germany and France will reportedly refuse to talk about a post-Brexit transition deal until the UK settles its so-called divorce bill with the European Union. The two countries are set to reject one of the key proposals made by Theresa May in her Florence Speech, according to reports in the Financial Times. In the speech the Prime Minister suggested there should be a transition period once the UK leaves the EU, which she referred to as an "interim implementation period". This would see the UK stay in the single market for two years after Brexit in exchange for continuing to pay into the EU budget and continuing to obey EU rules and regulations. But when the EU's chief Brexit negotiator Michael Barnier met with ambassadors from the remaining 27 EU countries the idea was reportedly quickly rejected by Berlin and Paris. They reportedly said greater clarity was needed on the financial settlement, the Irish border and the rights of EU citizens before the UK's future relationship with the EU could be discussed. The news will be a blow to the Government, which had hoped a transition deal could be quickly agreed, allowing more time to negotiate on controversial issues. The latest setback follows the claim that EU negotiators have stepped up backroom Brexit talks with Labour over concerns about Theresa May's future.